Ah … finally! The teenage-girl-looking android, Drossel makes her comeback to the Nendoroid realm. However, this time she is made based on the sequel (prequel?) series Fireball Charming. 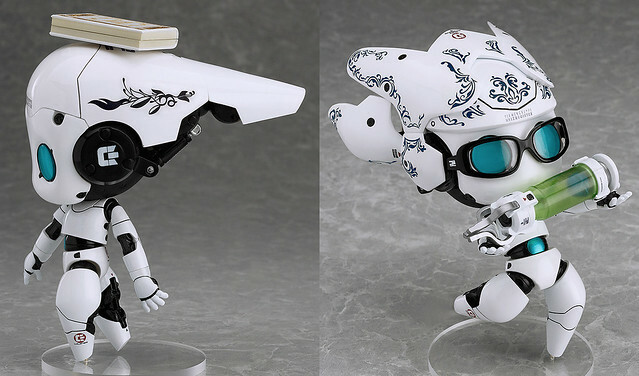 From ‘Fireball Charming’ comes a Nendoroid of the shiny white JUNO-XIII type Hyperion, Drossel! She includes a number of optional parts including the (thing that looks like a) blue rose that she got for her birthday, as well as her book-type recording device ‘Prospero’ and alternate parts to attach her perception unit, ‘Perdita’. She is also fitted with a special lighting gimmick so when there is a power outage in the estate she can still find her way around! Enjoy recreating a number of your favorite scenes from the series! ・Alternate arm and hand parts. As you can see in the official product description, she comes along with a lot of optional parts and accessories to compensate for the lack of the optional expressions. Oh, and she has the lighting gimmick too! Nendoroid Drossel (Charming) is priced at 4800 Yen and scheduled for November release. This entry was posted in News and tagged charming, drossel, fireball, nendoroid.